Also known as a biscuit quilt, this easy quilt is perfect for even a beginner to make and so cute! They make a great baby shower gift, Christmas present, or birthday present for a new baby. 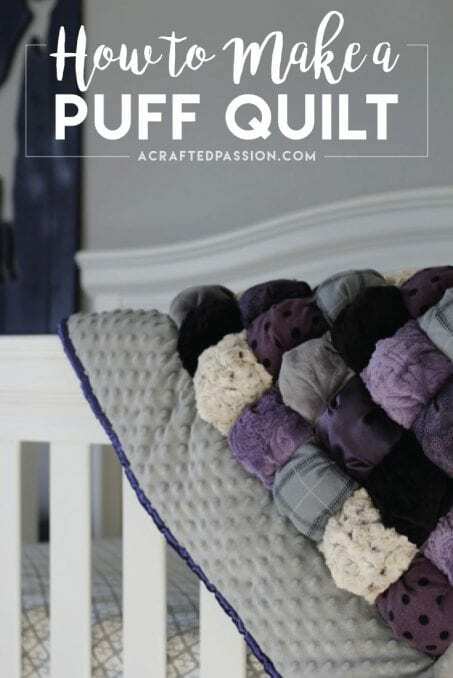 The puff quilt is so easy to make, anyone can do it. So here we go. Let’s start with what materials you will need. 1.5 yd of cotton-woven scrap fabric – Don’t use anything fancy here. I just cut up an old sheet I had and it worked great! Wonder clips – These are seriously amazing and are key to making you not pull out your hair keeping the two pieces of fabric together while seaming your squares together. They also have markings on the flat part of the clip to show you how far your seam allowance is. Plus, they don’t put pin holes in your fabric! Learn also how to sew a simple strip rag quilt with this TUTORIAL.